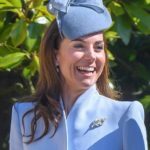 Yesterday, Duchess of Cambridge made two dazzling appearance, earlier in the evening she was in festive red for Christmas party hosted at the Kensington Palace and in the evening she had a change of wardrobe with a dazzling tiara and stunning gown for Annual Diplomatic Reception at Buckingham Palace. 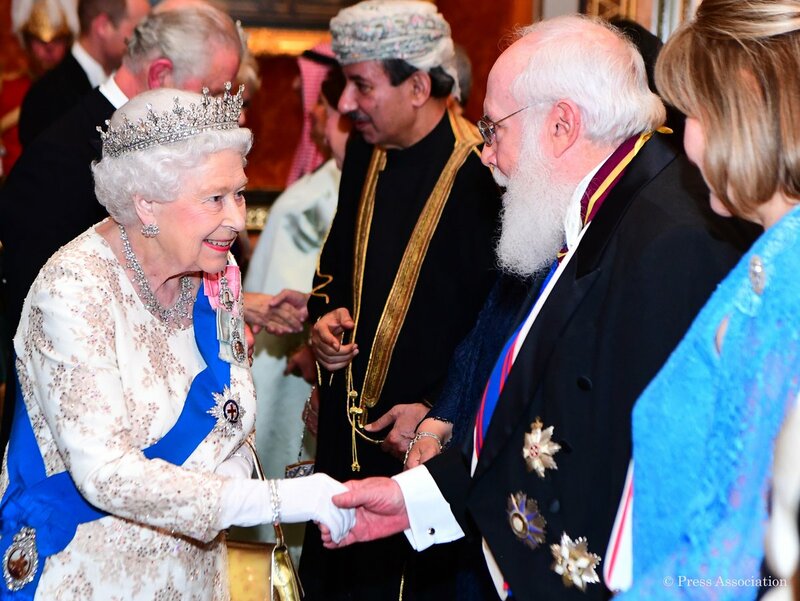 Every year in December, Queen Elizabeth II hosts a reception for the Diplomatic Corps, Ambassadors and High Commissioners, based in London who supports the work of the Royal Family in representing the UK at home and abroad. 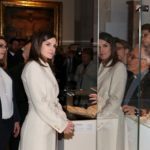 This work includes the hosting of State Visits and The Queen’s regular audiences with Ambassadors and High Commissioners. The reception was held at one of the largest multi-purpose room of Buckingham Palace – the ballroom. Since its opening 1856 for the celebration of Crimean war, the room is used for hosting state banquets and state events. 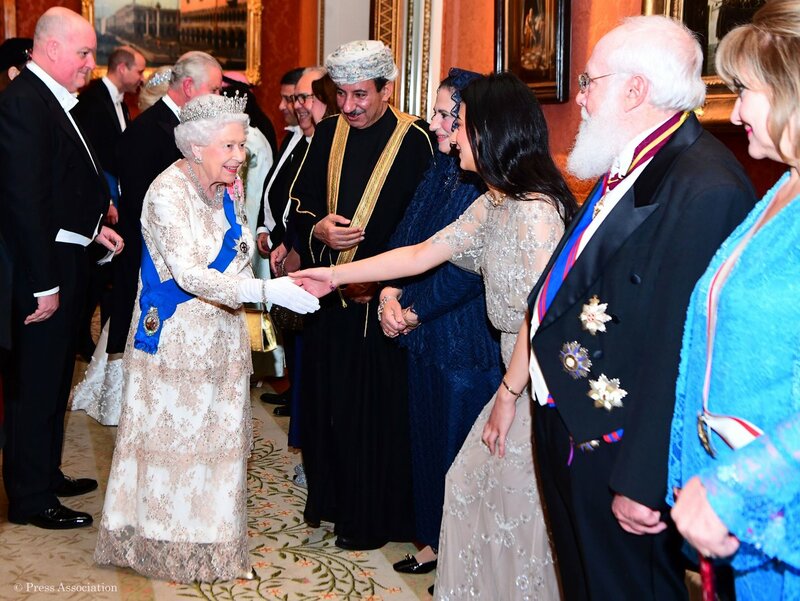 Supporting the Queen last night were Prince of Wales, Duchess of Cornwall, Duke and Duchess of Cambridge. The reception is a white-tie event that means tailcoats for gentlemen, gown and tiaras for ladies with RFOs. 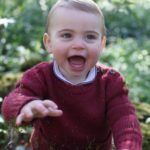 Queen wore her Girls of Great Britain and Ireland tiara. 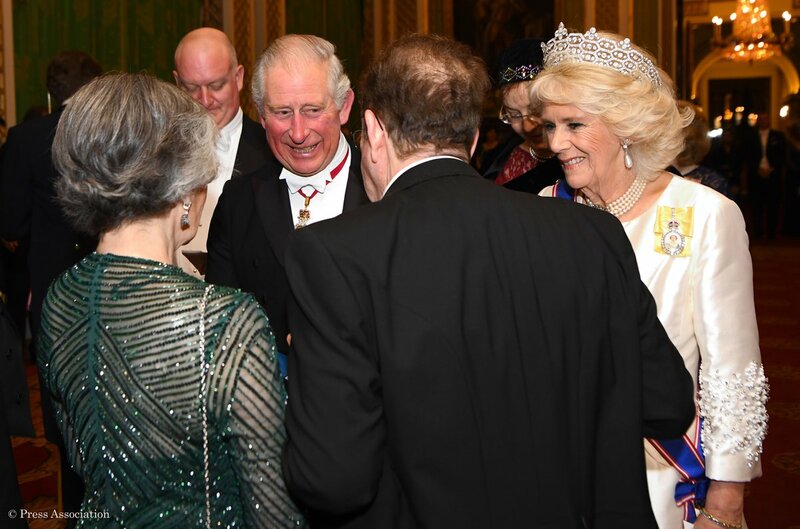 Camilla, Duchess of Cornwall, was wearing Greville tiara. For the night Catherine chose a gorgeous Princess look. She was wearing a stunning bespoke Jenny Packham gown. Thanks to Laura for her quick id and Heaven LM for getting confirmation from Jenny Packham. The pale blue gown has an asymmetric neckline with cap sleeves, a fitted bodice with a full sweeping skirt. The gown featured a delicate sequin work all over a sheer layer. 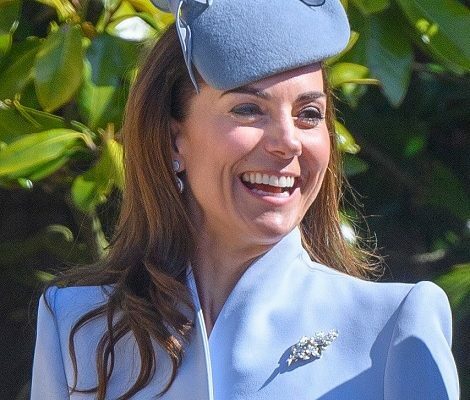 Once again Jenny Packham proves why Duchess trusts the label when it comes to the most important state evening occasions. A closer look at the gown. 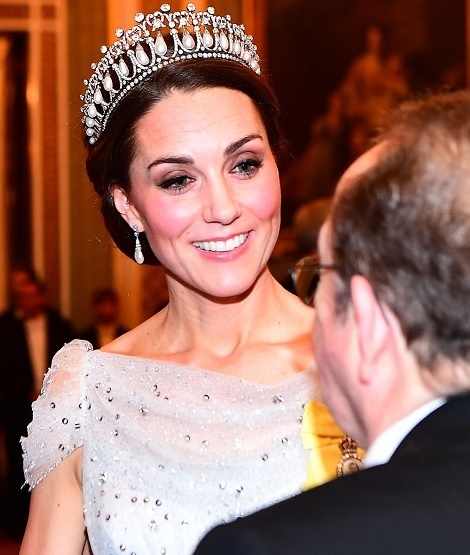 Catherine donned her favourite Queen Mary’s Lover’s Knot Tiara. 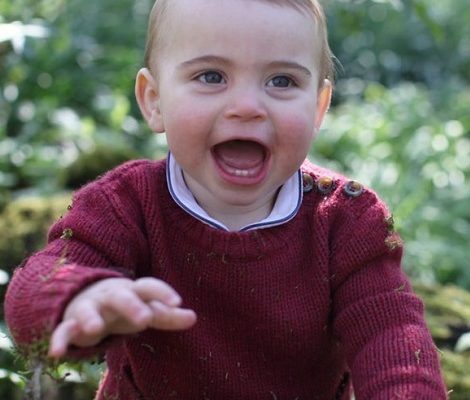 She recently wore the tiara at Netherlands State Visit in October 2018. 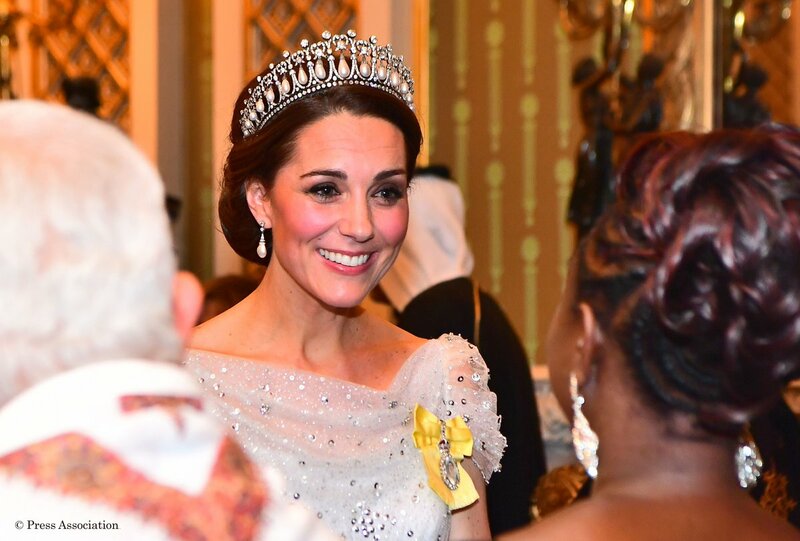 It was the 9th time when we saw Catherine wearing a tiara including her wedding in April 2011. 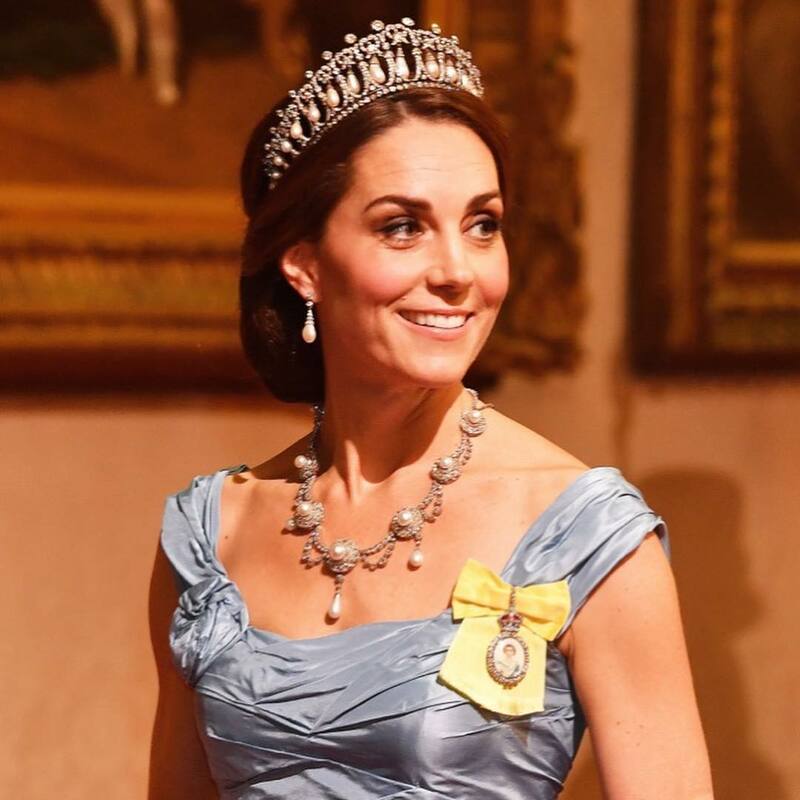 Made in 1913 for Queen Mary by the House of Garrard featuring 19 baroque pearl pendants and diamonds taken from other royal jewelry, the tiara has became Duchess’ signature tiara now, as she worn it on consecutive 6 royal events during 2016, 2017 and 2018. 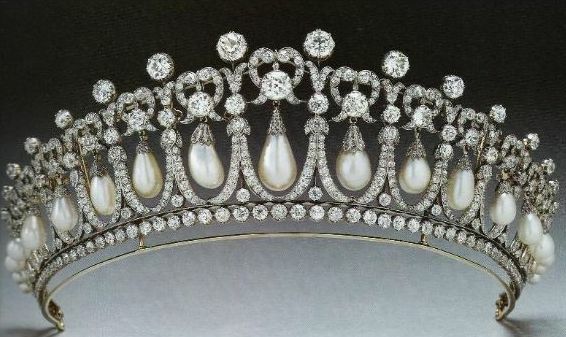 More about this tiara can be found here at the Order of Splendor. Duchess paired the tiara with another signature element , Lady Diana’s collingwood pearl earrings. 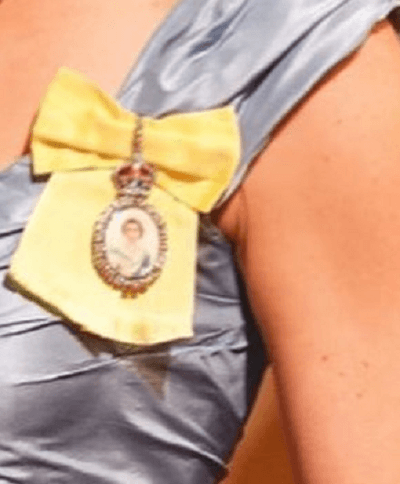 Catherine was seen wearing her Royal Family Order that she received last year. The interesting fact about the RFO is its made of glass instead of ivory. She was carrying her Jenny Packham Casa Clutch and was seen wearing a new diamond bracelet. On Wednesday the couple fly to RAF Akrotiri in Cyprus to meet with Serving personnel, families living on the base, wider station personnel and members of the local community. RAF Akrotiri is the home of the Cyprus Operations Support Unit which provides joint support to British Forces Cyprus and operations in the region to protect the UK’s strategic interests.